"We must distribute to others what Gurudev told all over the world, what Gurudev kept for us—his books, his audio and video recordings. What we invent or discover is not necessary to distribute; distribute what he told, what he invented and discovered, that is sufficient—people will be benefitted through that." "We have so many books, but we do not read them. We did not print books to use them as a paper plate for chanachur or samosas. When you get time, read the books. It is very important." "We do not want to be very big or gorgeous, we do not want be imitators, we want to have the real thing. That is why you must understand our conception. You must read Srila Sridhar Maharaj's books, Gurudev's books, then you will get some idea. I have told it many times: read when you get time. Read the books, try to understand the conception." "There are many books by Srila Sridhar Maharaj and by Gurudev, and our conception is there. You have the real food." "Guru always stays with us, always gives instruction to us. If we remember his instruction, his words, read his books, then we will always get his association through that, and you can easily understand it." "When you get time, read Gurudev's books. If you think, 'I am not getting any taste when I read the books,' then you can understand that inside you, in your heart, there is an aparadher bij (a seed of sin)." All English, Bengali, Hindi and selected Spanish books, as well as audio and video disks, of Sri Chaitanya Saraswat Math can be purchased at the online bookstore. Published in March 2015, this book has been prepared at the express request of Sri Chaitanya Saraswat Math's present Sevaite-President-Acharya Om Visnupad Srila Bhakti Nirmal Acharya Maharaj. It is his desire that Srila Jagadananda Pandit's bright and straightforward instructions guide devotees in their practice and preaching. Download (1.5 Mb) The two Guidance books (Volume One and Volume Two) of His Divine Grace Om Vishnupad Srila Bhakti Nirmal Acharya Maharaj that were published in 2015 are now available for download in PDF. 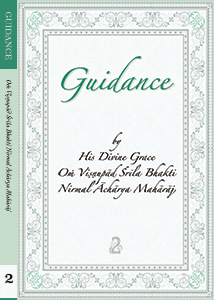 Guidance 3 Guidance 3 is the English translation of Bengali book Sri Upadesh 3 that has been penned by the lotus hand of Srila Acharya Maharaj himself and is full of unprecedented siddhanta. All these books, as well as other publication from Sri Chaitanya Saraswat Math, are available for purchase at our main temples in India, as well as online from any country all over the world. All online orders are sent from Kolkata, India. An ePub file for offline reading on mobile phones and tablets containing the lectures of His Divine Grace Srila Bhakti Nirmal Acharya Maharaj published here from 26 July 2014 to 31 December 2014. We pray this serves as a source of guidance, nourishment, and life to all the devotees and well-wishers worldwide. An ePub file for offline reading on mobile phones and tablets containing the lectures of His Divine Grace Srila Bhakti Nirmal Acharya Maharaj published here from January to March 2015. An ePub file for offline reading on mobile phones and tablets containing the lectures of His Divine Grace Srila Bhakti Nirmal Acharya Maharaj published here from April to June 2015. An ePub file for offline reading on mobile phones and tablets containing the lectures of His Divine Grace Srila Bhakti Nirmal Acharya Maharaj published here from July to September 2015. An ePub file for offline reading on mobile phones and tablets containing the lectures of His Divine Grace Srila Bhakti Nirmal Acharya Maharaj published here from October to December 2015. "Sri Chaitanya-charitamrita: Sri Rupa-Satana Sikha, read and expounded by His Divine Grace Om Vishnupad Srila Bhakti Nirmal Acharya Maharaj." An electronic version of the published previously online matter available now for download, reading and worshipping on phones, tablets, eBook readers, etc. An ePub file for offline reading on mobile phones and tablets containing the lectures of His Divine Grace Srila Bhakti Nirmal Acharya Maharaj published here from January to March 2016. An ePub file for offline reading on mobile phones and tablets containing the lectures of His Divine Grace Srila Bhakti Nirmal Acharya Maharaj published here from March to June 2016. An ePub file for offline reading on mobile phones and tablets containing the lectures of His Divine Grace Srila Bhakti Nirmal Acharya Maharaj published here from July to September 2016. An ePub file for offline reading on mobile phones and tablets containing the lectures of His Divine Grace Srila Bhakti Nirmal Acharya Maharaj published here from October to December 2016. An ePub file for offline reading on mobile phones and tablets containing the lectures of His Divine Grace Srila Bhakti Nirmal Acharya Maharaj published here from January to March 2017. An ePub file for offline reading on mobile phones and tablets containing the lectures of His Divine Grace Srila Bhakti Nirmal Acharya Maharaj published here from April to June 2017. An ePub file for offline reading on mobile phones and tablets containing the lectures of His Divine Grace Srila Bhakti Nirmal Acharya Maharaj published here from July to September 2017. An ePub file for offline reading on mobile phones and tablets containing the lectures of His Divine Grace Om Vishnupad Srila Bhakti Nirmal Acharya Maharaj published here from October to December 2017. An ePub file for offline reading on mobile phones and tablets containing the lectures of His Divine Grace Om Vishnupad Srila Bhakti Nirmal Acharya Maharaj published here from January to March 2018. An ePub file for offline reading on mobile phones and tablets containing the lectures of His Divine Grace Om Vishnupad Srila Bhakti Nirmal Acharya Maharaj published here from April to June 2018. An ePub file for offline reading on mobile phones and tablets containing the lectures of His Divine Grace Om Vishnupad Srila Bhakti Nirmal Acharya Maharaj published here from July to September 2018. An ePub file for offline reading on mobile phones and tablets containing the lectures of His Divine Grace Om Vishnupad Srila Bhakti Nirmal Acharya Maharaj published here from January to March 2019. This book was prepared and published first in 2006 by Sripad Bhakti Premik Siddhanti Maharaj, and was received with great joy by His Divine Grace Srila Bhakti Sundar Govinda Dev-Goswami Maharaj. This book is now available on the website for both online reading and downloading as a PDF. Printed in March 2004, this book is an extensive compilation of lectures and discourses of His Divine Grace Om Vishnupad Srila Bhakti Sundar Govinda Dev-Goswami Maharaj that were printed over the years in such publications as Sri Chaitanya Saraswati, Sri Gaudiya Darshan, Divine Message, and others. The Divine Pastimes of Sri Nityananda Prabhu compiled from lectures of His Divine Grace Srila Bhakti Sundar Govinda Dev-Goswami Maharaj accompanied by a compilation of scriptural verses, kirtans, and Sanskrit compositions glorifying Lord Nityananda Prabhu. Printed in December 1990, this is the first printed publication compiled from lectures of Srila B.S. Govinda Dev-Goswami Maharaj and it is a jewel full of spiritual nourishment, encouragement and guidance, explaining the pitfalls, the ups and downs a divine servitor faces on the path of their practising life and divine service. A very gentle and affectionate guidance from the lotus mouth of Srila B.S. Govinda Dev-Goswami Maharaj on how to maintain enthusiasm in our devotional life, how to adjust ourselves to different circumstances in life, and how to keep the vision of our brightest prospect. Published in 1992 to celebrate the Golden Jubilee of Sri Chaitanya Saraswat Math, the book presents a series of reflections of Srila B.S. Govinda Dev-Goswami Maharaj on how the Math was founded and developed over the course of time, as well as affectionate guidance for the practitioners on how to proceed in their spiritual life. Printed originally in 1993, this is the third book by Srila Bhakti Sundar Govinda Dev-Goswami Maharaj that was published from Sri Chaitanya Saraswat Math. It contains the wealth of extensive guidance on how to see, how to reach, and how to serve the transcendental Holy Dham of the Lord, as well as how to guard against the obstacles on the way. Printed in 1993 upon the completion of the first World Tour of His Divine Grace Om Vishnupad Srila Bhakti Sundar Govinda Dev-Goswami Maharaj, this book contains several discourses His Divine Grace delivered in Santa Cruz (USA), Hawaii, and Mauritius and that present Krishna consciousness conception in a very clear and concise manner. A Bengali poem written by His Divine Grace Srila Bhakti Sundar Govinda Dev-Goswami Maharaj in 1955: "I do not desire to be an autonomous king of this world. I do not desire to be an exalted young renunciant on the path of liberation... I only want to have love and attachment to the feet of Sachi Suta's servants." "Srila Jajavar Maharaj joined the Gaudiya Mission of Srila Bhakti Siddhanta Saraswati Thakur at a very young age. He could sing nicely, and he looked very simple—there was not a shadow of inauspiciousness in his body..."
"Ajita Krishna Brahmachari was an ideal servitor of Srila Guru Maharaj. I am surprised to see his mood of service. I did something, no doubt, but he used ten times more energy for the service of Guru Maharaj! That was his peculiarity. That type of all-rounder brahmachari was the wealth of our mission." His Divine Grace Om Vishnupad Jagad-Guru Srila Bhakti Sundar Govinda Dev-Goswami Maharaj is remembering the character and disappearance of Sripad Rishabdev Prabhu: "I have seen so many miracles in my life, and Rishabdev Prabhu is also one kind of a miracle personality. If you see what your scriptures say (they show so many rule and regulations) and if you see Rishabdev Prabhu's case, you will not be able to harmonise it." In honour of the sixth anniversary of the disappearance of His Divine Grace Om Vishnupad Srila Bhakti Sundar Govinda Dev-Goswami Maharaj we humbly present these pages containing the verses that were selected to adorn the samadhi-mandir of His Divine Grace. May these pages please and nourish the Vaishnavs' hearts. Manifest and revealed by His Divine Grace Srila Bhakti Sundar Govinda Dev-Goswami Maharaj. Excerpted from Golden Reflection. "Everyone who has got some faith in Lord Krishna is trying to study it, but if those who are suffering in this material world try to understand what is inside Srimad Bhagavad-gita, if they try to search what Krishna gave us inside it, they will be very benefitted." This comprehensive and fundamental book is compiled from informal talks of His Divine Grace Srila Bhakti Raksak Sridhar Dev-Goswami Maharaj and was presented to his holy lotus hands on 30 October 1983. Since then, it has been republished several times. Here we are presenting the latest, fifth, edition published in 2000. A profound publication exploring the theme of Guru and disciple, compiled from the discourses of His Divine Grace Srila B.R. Sridhar Dev-Goswami Maharaj—presented here in English and Bengali languages. This book has been compiled from the lectures of His Divine Grace Om Vishnupad Srila Bhakti Raksak Sridhar Dev-Goswami Maharaj and found a very special place in the heart of its author to the extent that His Divine Grace remarked it was his favourite English language publication. The text presented here is the second edition of the book. "The Lord's Loving Search for His Lost Servants: Great intensity is expressed here in a simple way. It is a mad search—an urgent campaign. With great earnestness Krsna comes to deliver His lost servants, to take us home." The complete and unamended text is now available for online reading and download. The All-Auspicious Name of Sri Chaitanya Saraswat Math. Srila B.R. Sridhar Dev-Goswami Maharaj expounds on the profundity of the Mission's name. Why is happiness eluding us? In which way can we attain divine life? What is God? What will be our connection with Him? How to make progress from unfulfilled life towards fulfillment? Where is our real home? Srila Bhakti Raksak Sridhar Dev-Goswami Maharaj explains in simple words that touch the heart. A poem composed by Srila Bhakti Raksak Sridhar Dev-Goswami Maharaj after the disappearance of his Divine Master Bhagavan Srila Bhakti Siddhanta Saraswati Thakur Prabhupad: "O Dina-nayana, wherever that great soul may be, please quickly take this servitor there." "I offer my respects unto Sri Gaurangadev, who rose like a golden moon in Sri Mayapura in 1407 Sakabda, revealed the Pastime of accepting the garments of the renounced order, sannyas, in 1431 Sakabda in order to benedict the entire material universe, and disappeared beyond the ordinary vision of the people of this world in 1455 Sakabda. I offer my obeisances to that beautiful Golden Lord, Gaurangasundar, the divine form of Krishna prema." "What have I not done to carry out the orders of these enemies living within me? Now I am disgusted, my Lord. I do not know why, how, but I was able to avoid their vigilant eyes and I have now run to You! Please give me some engagement!" A heart-felt poem composed by His Divine Grace Srila Bhakti Raksak Sridhar Dev-Goswami Maharaj: "Don't abandon me. Deliver this servant. O Krishna! O ocean of mercy for the destitute! Helplessly subjugated by material nature, I have fallen within this terrible world." "Vishvambhar, the son of Jagannath Mishra, who resides in Nabadwip, Sachi's Nimai, oh! He has taken sannyas." A quote of Srila Bhakti Siddhanta Saraswati Thakur Prabhupad that is printed and hung on the wall at the veranda of His Divine Grace Srila Bhakti Nirmal Acharya Maharaj: "If someone does not consider it necessary to faithfully follow their Guru and the Vaishnavs, their endeavour to serve the Lord is not service to the Lord—it is service to maya." Presenting Sri Sri Brahma-samhita scripture adorned with and enriched by the commentary of Srila Sachchidananda Bhaktivinod Thakur. 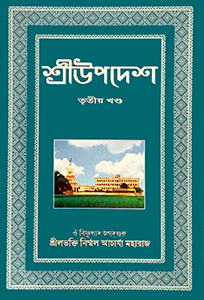 Published from our Sri Chaitanya Saraswat Math in 1992, this books is now available for reading online for the first time, as it is, without amendments or edits; the scanned pages contain both the English translation and the Bengali texts. The index page for Sri Gaudiya Gitanjali song book. The page contains links to the kirtans that have been posted here so far and that are sung regularly at our Sri Chaitanya Saraswat Math. More kirtans shall be added in the course of time. A song composed by Srila Narahari Thakur in glorification of Srila Jiva Goswami Prabhu's life, character, and service. Bengali verses and English transliteration. "Dive deep, do not be satisfied with the surface understanding. It is necessary for us to go to the core, and this is beyond all visual, mental, and objective understanding... I have no hope, or even necessity, to know Krishna, but if I can serve guru or the servant of the guru, then I feel this is the perfection." His Divine Grace Om Vishnupad Srila Bhakti Nirmal Acharya Maharaj's letter on the initiating Gurus offering fundamental guidelines for all members of Sri Chaitanya Saraswat Math on the proper mood, creed, and behaviour. Una carta de Su Divina Gracia, Om Vishnupad Srila Bhakti Nirmal Acharya Maharaj acerca de los Gurus iniciadores ofreciendo una guía fundamental para todos los miembros del Sri Chaitanya Saraswat Math acerca del humor, la convicción y el comportamiento apropiados. Письмо Его Божественной Милости Ом Вишнупада Шрилы Бхакти Нирмала Ачарьи Махараджа на тему инициирующих гуру, содержащее в себе оснопологающее руководство для всех членов Шри Чайтанья Сарасват Матха о том, какими должны быть наши идеалы, настроение и поведение. "I am writing to you all with an affectionate advice to please be careful with reading, hearing and spreading different kinds of information that is available on the internet, social networks, etc...."
"Dear devotees, please accept my humble obeisance. I am sending this message in reply to the email about me that was sent to the devotees worldwide recently..."
A document prepared by Om Vishnupad Srila Bhakti Nirmal Acharya Maharaj to clarify some of the confusion that has existed within the family of Sri Chaitanya Saraswat Math regarding Srila Gurudev's vision and directives for the Mission after his departure. "Hereby, I do reveal my final desire and directives unto all my Eastern and Western lady and gentlemen disciples, as well as to the faithful souls devoted to the Divinity..."
"Those who have any regard for me should give this respect and position to Govinda Maharaj as my successor. As much as you have faith in my sincerity, then with all sincerity I believe that he has got the capacity of rendering service in this way." "He, (Bhakti Nirmal Acharya Maharaj), is highly qualified and I have chosen him as next Acharya of this Math. All of you should unitedly proceed under his guidance, serve under him faithfully and love him." Taking the holy footdust of Sri Gurupadpadma Om Vishnupad Srila Bhakti Nirmal Acharya Maharaj on our fallen head we are presenting pages dedicated to the spiritual practices that are recommended for the spiritual health of a disciple. We pray that this compilation gives nourishment, energy, and assistance to the devotees and sincere seekers worldwide. The Holy Name and the Ten Offences to be avoided. The booklet that Srila Gurudev gives to all his disciples at the time of initiation with the words, "Take this book and memorise it." What is favourable and what is unfavourable to devotion? What are the offences to the Holy Dham and service? What activities are considered to be devotional? How to behave and practise to please Srila Gurudev? All these and many more questions are answered in this compilation. 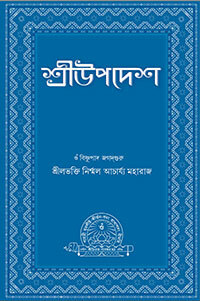 Also available in Bengali—বাংলা সংস্করণ. "কর্ম্মী, জ্ঞানী, যোগী ও ভগবদ্ভক্ত সম্প্রদায় সকলেই নিজ নিজ বিচার সমূহের নির্য্যাস—পূর্ণ ও উজ্জ্বল ভাবে ইহাতে দেখিতে পান ও তজ্জন্য সকলেই এই গ্রন্থরাজকে আদর করিয়া থাকেন ।"
"শ্রীভগবানের সেবাদ্বারাই সমস্ত সিদ্ধি হয়—এই প্রকার বিশ্বাসচালিত হইয়া শাস্ত্রবিধিরও দাসত্ব পরিত্যাগপূর্ব্বক সর্ব্বতোভাবে একমাত্র কৃষ্ণপাদপদ্মাশ্রয়কেই শরণাগতি কহে । শ্রীহরিচরণে শরণাগতি দ্বারাই শ্রবণকীর্ত্তনাদি ভক্ত্যঙ্গসমূহের যাজনে অসমর্থ ব্যক্তিরও সর্ব্বলাভ হইয়া থাকে ।"
"আনের মন রাখিতে গিয়া আপনাকে দিবে ফাঁকি মনের কথা জানে গোরা কেমনে হৃদয় ঢাকি । গোরা বলে, 'আমার মত করহ চরিত আমার আজ্ঞা পালন কর চাহ যদি হিত' । 'গোরার আমি, গোরার আমি' মুখে বলিলে নাহি চলে, গোরার আচার, গোরার বিচার লইলে ফল ফলে, লোক দেখান গোরা ভজা তিলক মাত্র ধরি' গোপনেতে অত্যাচার গোরা ধরে চুরি ।"
"এই মৃত্যুময় ও দুঃখময় পৃথিবীতে অমৃতময় আশা ও আনন্দের দিব্যদূত হলেন শ্রীগুরুদেব । তাপিত, পীড়িত জনগণের জন্য তাঁর আবির্ভাবই সবচেয়ে শুভ ও আনন্দদায়ক ঘটনা । এর তুলনা হতে পারে একমাত্র প্রভাতের শুকতারার সঙ্গে, যা কিনা মরুভূমিতে দিগ্ভ্রান্ত যাত্রীকেও পথ দেখাতে পারে । শ্রীগুরুদেবের করুণাময় হস্তের কোমল স্পর্শই সমস্ত অশ্রুপ্লাবিত নয়নের অবিরাম অশ্রুকে মুছিয়ে দিতে পারে । আহা, সেইদিন কবে আসবে যেদিন এই দুর্ভাগা জীব শ্রীগুরুদেবের অহৈতুকী করুণা হৃদয়ঙ্গম করতে পারবে ।"
"বর্ত্তমানে আমরা বহির্জগতে আছি আর আমাদের মনও বহির্মুখী হয়ে আছে । অসহায়ের মত আমরা এদিক ওদিক ঘুরে বেড়াচ্ছি । শ্রীভগবানের প্রতিনিধিদের কৃপাই আমাদের একমাত্র আশাভরসা । তাঁরা এসে পতিত আমাদের তুলে ধরেন আর সাবধান করে দেন, 'কি করছ তোমরা ? এদিকে যেও না, এ দেশ বিপদের দেশ, মৃত্যুর দেশ । এসো আমার সঙ্গে । আমি তোমাকে অমৃতের দেশে নিয়ে যাবো ।'"
"এই মনুষ্য জন্ম পেলেই তোমার সেই eternal life এর solution (সমাধান)-এর জন্য যা করণীয় তাই করবে । এই ভাবে জীবন ধারণই হচ্ছে বুদ্ধিমত্তা । আর যদি না করলে যে chance (সুযোগ)-টা তুমি miss (হারালে) করলে তাতে suicide (আত্মহত্যা) করা হল । এই valuable (মূল্যবান) মনুষ্য জন্মটা পশুর কার্য্যে দেওয়া মানেই সোনা দিয়ে গর্ত্ত বোঝাই করা, এর চেয়ে দুঃখের আর কি হতে পারে ।"
"এ বৎসর অধি-মাস বা পুরুষোত্তম-মাস সমুপস্থির হইয়া জীবের জাগাকে অধিক কৃষ্ণসেবানুকূল্যময় করিয়াছেন । পুরুষোত্তম-মাস, ভগবান পুরুষোত্তমের ন্যায় সর্ব্বগুণাধার এবং অন্যান্য সমস্ত মাসের মুকুটমণি স্বরূপ ।"
"কৃষ্ণসেবা সম্বন্ধরহিত হইয়া ব্যষ্টিগত ও সমষ্টিগত ভোগার্থ যাহা ব্যয়, তাহাই অপব্যয় । বিড়ালের বিবাহ, পুতুল বিবাহ, দেবলমাত্র ভোগসর্ব্বস্ব মানুষের বিবাহ, ভোগের অধিকতর ইন্ধন-সংগ্রহের জন্য চণ্ডী বিষহরির পূজা উৎসবে অর্থ ব্যয়, নাস্তিকতার শিক্ষায় শিক্ষিত হওয়ার জন্য অর্থ ব্যয় অপব্যয় মাত্র ।"
ভগবান শ্রীল ভক্তিসিদ্ধান্ত সরস্বতী ঠাকুর: "ভক্ত নিত্যকাল গুরুর আনুগত্যে শ্রীকৃষ্ণ সেবা করিয়া থাকেন । যেখানে গুরু ও বৈষ্ণবের আনুগত্য বাদ দিয়া হরিভজনের প্রয়াস—তাহা হরিভজন নহে—মায়ার ভজন ।"
শ্রীল ভক্তিসুন্দর গোবিন্দ দেব গোস্বামী মহারাজ: "বলতো ভাই, তুমি কি চাও ? তোমার চাহিদা কি ? তুমি এই প্রাণীবহুল কর্ম্মমুখর জগতে দিবারাত্র অক্লাস্ত পরিশ্রম করেই চলেছ ! কেন ? সত্য কথা বল !" শ্রীল ভক্তিসুন্দর গোবিন্দ দেব গোস্বামী মহারাজ: "কীট হইতে ব্রহ্মা পর্য্যন্ত জীব সমুদয় আনন্দের সন্ধানে ব্যাপৃত, আনন্দই যে সকলের প্রয়োজন ইহা কাহাকেও বুঝাইয়া দিতে হয় না ।"
"অশ্রুসজল-নয়নে প্রতিটী জীবের কাছে তাঁহাদের কাতর আবেদন জানাইয়া বলিয়াছেন ;— ওগো অমৃতের সন্তানগণ, এই মূল্যহীন জাগতিক লাভ-লোকসান ব্যাপারে বৃথা কালক্ষেপ না করিয়া একবার শ্রীভগবানের শরণ লও ।"
শ্রীল ভক্তিরক্ষক শ্রীধর দেব গোস্বামী মহারাজের কাব্য: "মিশ্র-সুত বিশ্বম্ভর নবদ্বীপ বাস, শচীর নিমাই ঐ করেরে সন্ন্যাস ।"